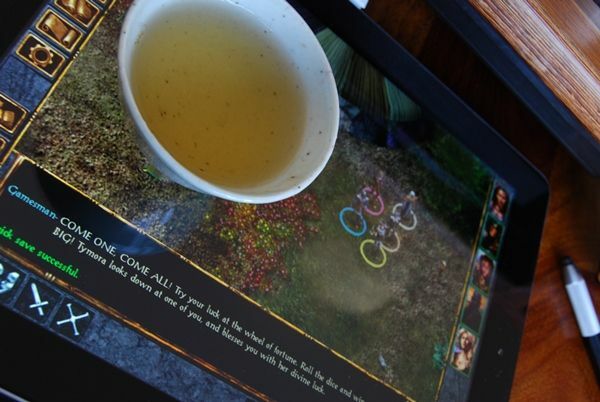 Looking back over recent posts, you would be forgiven for thinking that I only manage to find time sufficient to drink those teas that are sent to me by others. In part, there is a truth to that conclusion, because the number of sessions that I can grab per week has dwindled significantly (for all the right reasons). 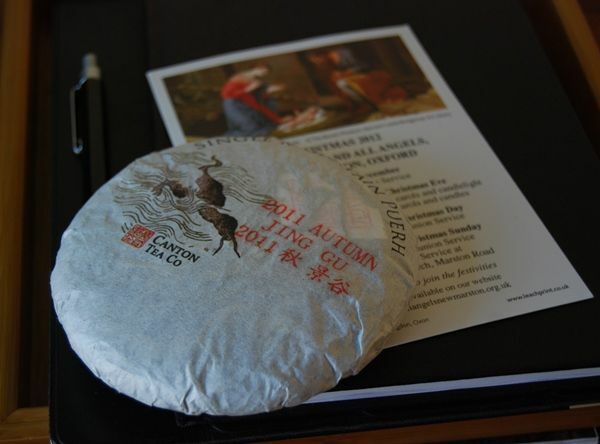 In that manner, I present to you some scant notes on the remaining three xiaobing from Canton Tea's boxed set of five taster cakes, produced by the Mighty Scott of Yunnan Sourcing. In the funny old world of pu'ercha, there are few constants, and few true heroes. Without sounding (I hope) too much like a swooning fan, I would be dishonest if I did not express my appreciate for Scott Wilson, who has done so much for the world of pu'ercha in the west. Most of this springs from a love of his subject, and he has combined the selling of low-cost, but very tasty, cakes with a more recent trend (during the past four or five years) towards making his own. The latter are, similarly, priced very fairly, which keeps me coming back to his web-site almost eight years from when I first went there. He has outlasted many competitors, and continues to find innovative, high-quality products that continue to impress me. Moreso every year, in fact, as his skill at selecting maocha steadily increases. One feels "in safe hands" when trying his cakes. In fact, I would probably go so far as to say that he has a "house style", and that I am in danger of being able to recognise it. 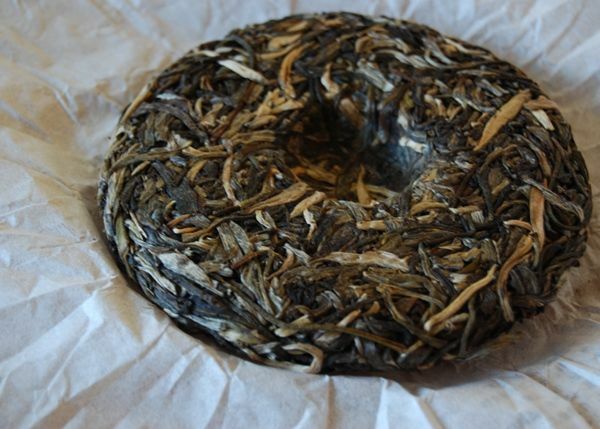 To varying extends, that "house style" is apparent in these cakes sold by Canton Tea, which represent a very interesting sampling of the pu'ercha gamut. 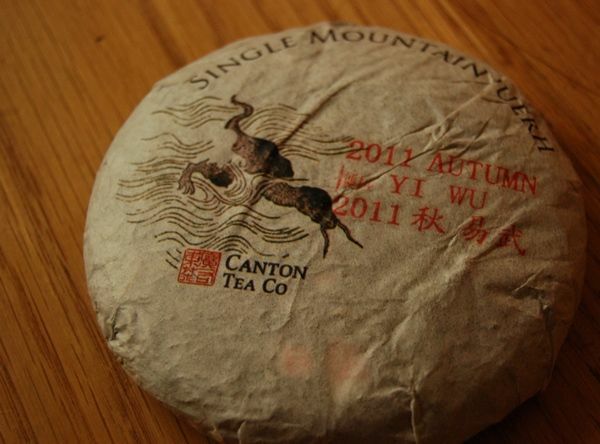 If one were to pick five genres for inclusion in a tasting set, it may end up containing tea from regions a lot like those for which Canton Tea has plumped. This first cake is from Jinggu, which is an autonomous county-level area in Simao prefecture. 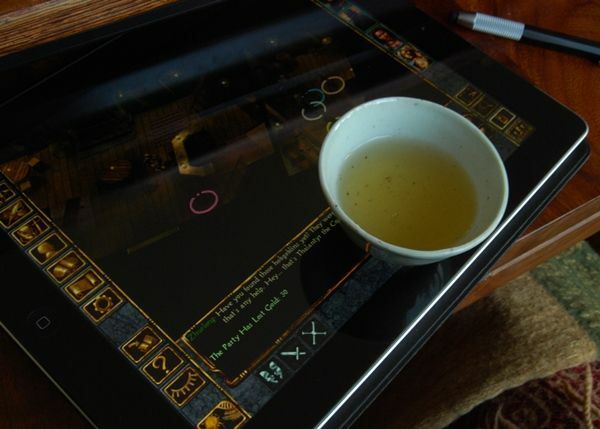 It is particularly hard to get Jinggu teas right, I believe - they tend to become rather "drink it now" than anything more complex. However, Scott is one of the few people that gets it right, from this district. Pictured above, the tippy fat leaves typical of cakes from this region are obvious in the cake (and run all the way through it). 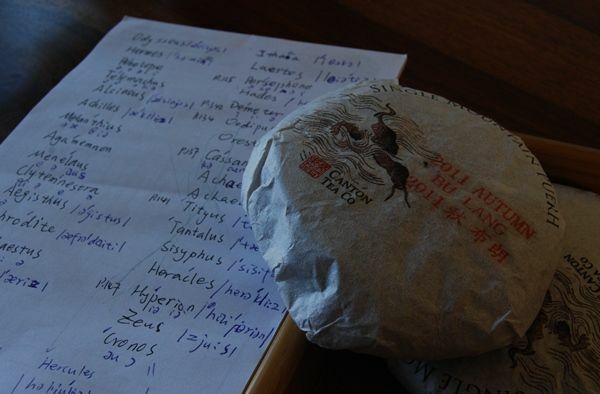 Similarly, below, we can see that the maocha is decidedly unlike that one would find in the more orthodox regions. The new wild mage character in the "extended edition" is tremendous fun. While fighting a tough enemy (some sort of wight), my wild mage attempted to cast a low-level attack spell and accidentally opened a dimensional portal, through which a huge demon came (complete with horns, flames, and strange name), and which promptly started to eat my party. The autumnal Bulangshan cake, shown below, was actually that which I tried first. When the box arrived at my laboratory, I couldn't help but try one of the cakes, and it probably says something about my tastes that I immediately went for the Bulangshan. 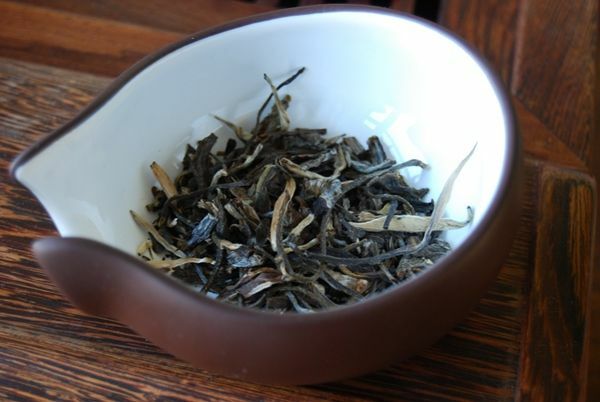 In contast to the Jinggu cake, the Bulangshan leaves are much more rough-and-ready: they are fragmented and small, and yet have the warm, sweet scent of autumnal tea. The cloudy orange soup soon clears into a clean liquid (after an infusion or two), and exhibits the heavy sweetness that one would anticipate of autumn leaves. Unsurprisingly, this cake is strong: its kuwei pushes on and on, leading to some significant cooling sensations and shengjin [mouth-watering] that works very well. Beneath the purity of its strength lies the sweet-grass-and-leather that I associate with that region's flavour; cooling, bitter, and yet charming, this is a feisty little cake. My journal has "very strong, very straightforward, and really rather good". This last cake was one that I gave to THE JAKUB when he recently visited: I grabbed the first cake that I could find on the way out of the house, which happened to be the last that I had tried. Unfortunately, it is also the weakest of the bunch - apologies, JT! Autumnal Yiwushan cakes are a dangerous breed: they often go awry, to my tastes. Even the good ones (I recall some older Douji cakes) tend to me a little muted with respect to springtime cakes from the same year. I am afraid that this cake is not up to that standard. It is precisely as one might expect: sweet, orange, fruity, but not exceptionally interesting in any particular way. 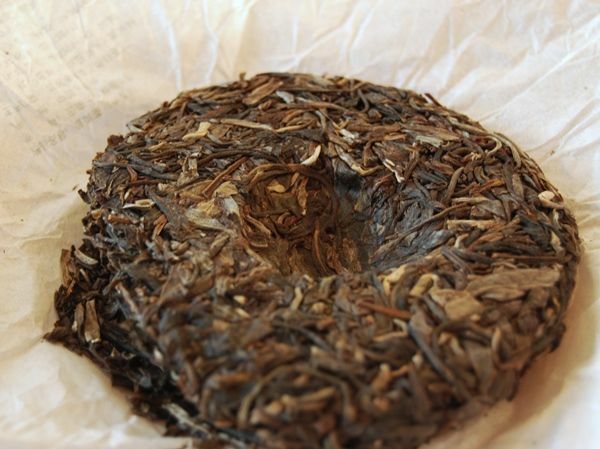 It is cooling and clean, courtesy of its good production, and has a certain throatiness, but in a world saturated by Yiwu cakes, there are many better examples with which to spend ones time and money. 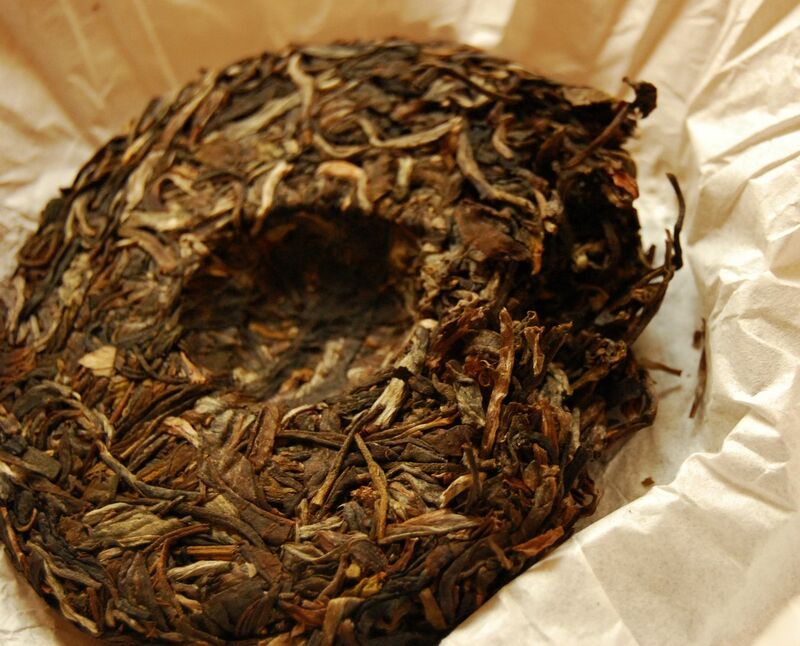 It is from Luoshuidong, an area of Yiwu that is not synonymous with great pu'ercha in my limited experience. Overall, the boxed set of five cakes is a very decent selection, and I have accidentally ended on a low note, whereas the previous four cakes were all enjoyable in their own way, and all sufficiently different in style to justify inclusion in a taster set. I am most grateful to Canton Tea for the generous gift, and am sure that their audience will enjoy such an introduction to the complex world of Yunnan tea that we love to explore.